During the first two years of the Directory, the royalists, both absolutist and constitutional, distinguished themselves by the intensity of their counter-revolutionary activity. They were equally as likely to use violence as the rare legal options at their disposal. They relentlessly plotted a hypothetical restoration and were helped in this by some important figures in the revolutionary ranks such as Generals Jean-Charles Pichegru and Jean Victor Marie Moreau. It took nothing less than a coup d'état on 18 Fructidor Year V, organized by the Directory itself, to put a stop to their machinations. Military support for this coup d'état was provided by General Charles Augereau who had been sent from Italy by Napoleon Bonaparte. The day after the failed coup d'état on 13 Vendémiaire, the constitutional royalists had renounced violence in favour of pursuing power by an electoral route. To this end, they created the "Philosophical Institutes". These amounted to organizations in each department that were ostensibly devoted to charity and philanthropy, but were secretly plotting the regime's destruction. Their secret objective was to keep republicans away from the ballot box and to attract honest people instead. These Institutes were made up of two groups: the legitimate sons were militant royalists often in favour of an absolute monarchy and the friends of order were moderates who were often unaware of the existence of the first group. The efforts of these organizations were successful. The elections on 1 Germinal Year V (March 21, 1797) returned only 13 out of 216 members to the Convention. Of these, only 8 were republicans, though Joseph Bonaparte, Napoleon's older brother, was among them. Though the royalists were at first tempted by an immediate restoration, they finally opted to wait for the next elections in Year VI before acting. In the mean time, they intended to continue to rise in public option and to reorganize the National Guard in their favour by ensuring its leaders were officers favourable to their cause. Once the next elections had confirmed the defeat of the vast majority of the former members of the Convention, the royalists would use their majorites in the houses to force their policies on the Directory. Almost immediately, the Councils of Five Hundred and of the Ancients decided to adopt a certain number of reactionary measures (the suspension of the laws against émigrés and resistant priests, for example) whose effects were quickly felt. The most important was the return of a White Terror that met with no serious repression. The Republicans found this development unsettling, especially the Italian Army and its High Command which was the subject of sharp critiques from the newly-elected Councils. Napoleon Bonaparte protested against the new laws and with his soldiers voted in favour of proclamations menacing the royalists: Soldiers, though mountains may separate us from France, you would cross them with the speed of the eagle, if needed, to defend the Constitution. Unfortunately, of the five Directors, only two were resolutely hostile to the royalists and determined to fight them. They were Louis-Marie de Larevellière and Jean-François Reubell. François Barthélémy had been appointed after the elections with the support of the monarchists and had adopted their positions. Lazare Carnot remained hesitant and avoided taking a side. As for Paul-François de Barras, he was evasive and indecisive. This set the stage for a political crisis that avoided violence only thanks to the disagreements within the royalist camp. Throughout the Italian Campaign, a general officer in the Italian Army - who has never been identified by historians despite their efforts - passed information to a hotbed of royalist activity led by Emmanuel-Louis-Henri de Launay, the Count d'Antraigues. This information revealed the core of Napoleon Bonaparte's plans to the Austrians and the British. Even though these leaks did not prevent many Allied defeats, in the spring of 1797, Bonaparte decided to put a stop the Count d'Antraigues' activities whose espionage was well-known to him. The Count was arrested on May 16 and imprisoned in Milan. 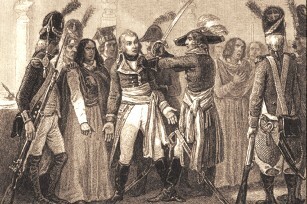 The papers discovered on his person were given to Bonaparte who began a lengthy interrogation with his prisoner after reading them. He then ordered the Count to write a summary of the papers. It is not clear whether this summary corresponded exactly with the original. It is possible that Bonaparte caused some passages to be eliminated to prevent his officers from being implicated. It should be noted that the prisoner's situation improved substantially after his secretarial work. Transferred from his cell, he was allowed to live under house arrest with his wife and children and managed to escape soon after without much difficulty. D'Antraigues would later claim that the content of the summary was dictated to him by Bonaparte. This assertion seems unlikely however, as other documents confirm the report's wording. The fact remains that the government relied upon this document to convince General Pichegru that treason had been committed and to justify the coup d'état of 18 Fructidor Year V.
While the republican manifestos adopted by his troupes spread throughout France, Napoleon Bonaparte sent the document written by the Count d'Antraigues to the Directory. As a result, Barras allied himself with Larevellière and Reubell. The three republican Directors kept this information to themselves, waiting to release the papers for maximum effect. The Directory began to reshuffle the government. Though the royalists had been demanding a cabinet shuffle for some time, the people who received promotions were far from those they had in mind: in particular, Lazare Hoche was named Minister of War. Under the guise of amassing a force to land in England, the new Minister brought his troupes to Paris. The Councils immediately and vehemently condemned the Directory. In this case, the law was on their side: Hoche did not meet the legal conditions for his position as he was too young to be a minister and his troupes had violated the constitution when they arrived within 60 kilometres of the capital. The Directory was forced to back down; Hoche was dismissed and his men had to leave Paris. But the royalists failed to capitalize on their advantage. Pichegru and Moreau were indecisive and eventually did nothing. Without Hoche, the Directory turned to Napoleon Bonaparte. In order to avoid compromising himself directly or inciting a rivalry, Napoleon dispatched Charles Augereau to France. Augereau was an ardent republican but a mediocre politician. Learning from recent experience, Augereau's soldiers were suddenly given leave and were now able to approach Paris without contravening the law. On 13 Fructidor, Larevellière vehemently denounced the royalists in a speech that they largely ignored. Pichegru continued to hold to the monarchists strategy of wait-and-see. This was a mistake. He finally decided to act on 17 Fructidor and asked the Councils to indict the Directors, but it was too late. In the night of 17-18 Fructidor, Augereau occupied Paris with his 12,000 men, 50 canons and the support of another general from the Italian Army, Jean Christophe Collin (called Verdière). The city's gates were locked, the post suspended, and a number of deputies and journalists were arrested. Some were even incarcerated in the Temple prison. Those arrested included the leaders of the constitutional royalists: the President of the Council of Five Hundred (Siméon); the President of the Council of the Ancients; Generals Pichegru, Moreau and Willot; and the Directors Barthélémy and Carnot. Though the latter managed to escape. At the same time, the walls of Paris were covered with posters revealing the treason of Jean-Charles Pichegru based on the papers of the Count d'Antraigues. The next day, elections from 49 departments were cancelled by the purged Councils and the defeated were declared elected. Soon after, the key leaders who had been arrested were sentenced to deportation to French Guiana (the dry guillotine ). By the evening of the 18th, it was finished. Not a single shot had been fired and none of the coup's victims were missed. The Coup d'État of 18 Fructidor began the trend of increasing power in the executive at the expense of the legislatures; this movement was set to continue. A strong and honest government, that is what I want, wrote Napoleon Bonaparte to Charles-Maurice de Talleyrand-Périgord on September 19. While the coup d'état granted the Directory a reprieve, it did not put an end to the machinations of the counter-revolutionaries. They were not completely beaten. They would continue to fight against a government that had lost its democratic legitimacy and owed its survival to the army. Soldiers! Though you may be far from your homeland and though you are the victors of Europe, new shackles were being prepared for you. You heard of it, you talked of it. The people rose up, identified the traitors and already they are in chains, proclaimed Bonaparte a few days later. Now the strong man of the regime, he was well aware of the power at his disposal and the debt owed to him by the members of the government. Two years later, he would remember it and remind them of it. In the mean time, he immediately demonstrated his new liberty by signing the Treaty of Campo-Formio on October 17 without consulting with Paris. This website has been designed for a screen resolution of 1280 x 800 pixels. Last update: 2019-03-21 21:42:31.